„I am talking about everyone gently“. Interview in the Slovak weekly Týždeň, 3/2016, pp. 20-22. ISSN: 1336-653x. Höschl C. Islam in Europe.. Reflex 3/2016, p. 70. Höschl C. Basic unconditional income. Reflex 4/2016, p. 70. Höschl C. Attractivity of non-existing worlds. Reflex 5/2016, p. 70. Höschl C. Strach z neznáma nebo ze známa [Phobia based on ignorance or on knowledge]? Magazine Friday, Lidové noviny [Public News], 5.2.2016, p. 4. Höschl C. Resistance to antibiotics. Reflex 6/2016, p. 70. Höschl C. Ten years old Miss. Reflex 9/2016, p. 66. Höschl C. Offsprings of homosexual couples. Reflex 10/2016, p. 70. Höschl C. Too many fortuities. 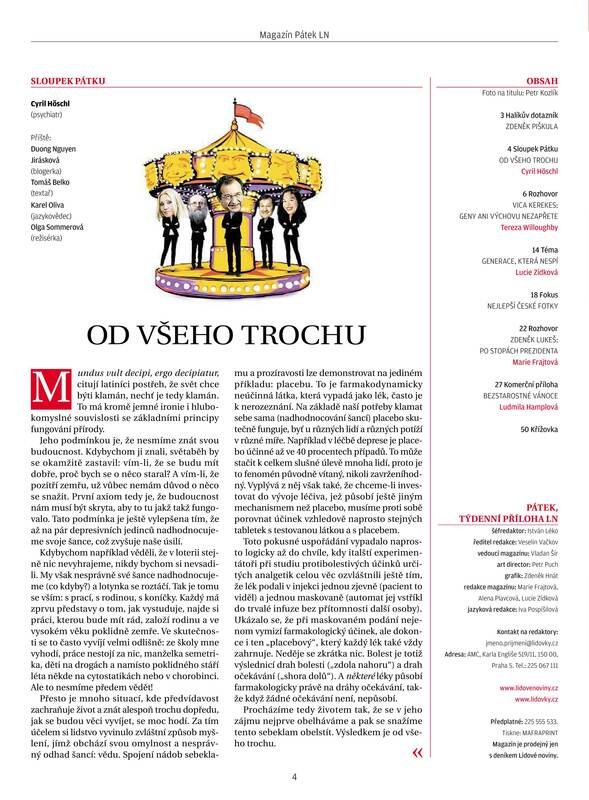 Magazine Friday, Lidové noviny [Public News], 11 March 2016, p. 4. Höschl C. Borderline personalities. Reflex 11/2016, p. 70. Höschl C. Little manipulators. Reflex 12/2016, p. 68. Höschl C. Movie cliches. Reflex 13/2016, p. 68. Höschl C. Idiotic mood Reflex 14/2016, p. 74. Depression is in genes, but… Interview for the magazine Téma (Theme), 15/2016, pp. 22-27. ISSN: 2336-4815. Höschl C. Increasing insomnia. Reflex 16/2016, p. 70. Höschl C.: Bewitchment by a seductive devil (why Hitler still fascinates us?). Reflex, 16/2016, p. 38. Höschl C. To keep one's word. Reflex 17/2016, p. 70. Höschl C. Penalty: prevention, restoration or revenge? Reflex 18/2016, p. 68. Höschl C. Who does not change his mind? Reflex 19/2016, p. 68. Höschl C. How to cope with insomnia and depression. Reflex 20/2016, p. 68. Höschl C. Responsible reproduction. Reflex 22/2016, p.68. Höschl C. Too many fortuities.Vita Nostra Servis, Magazine of the 3rd Medical Faculty of Charles University. 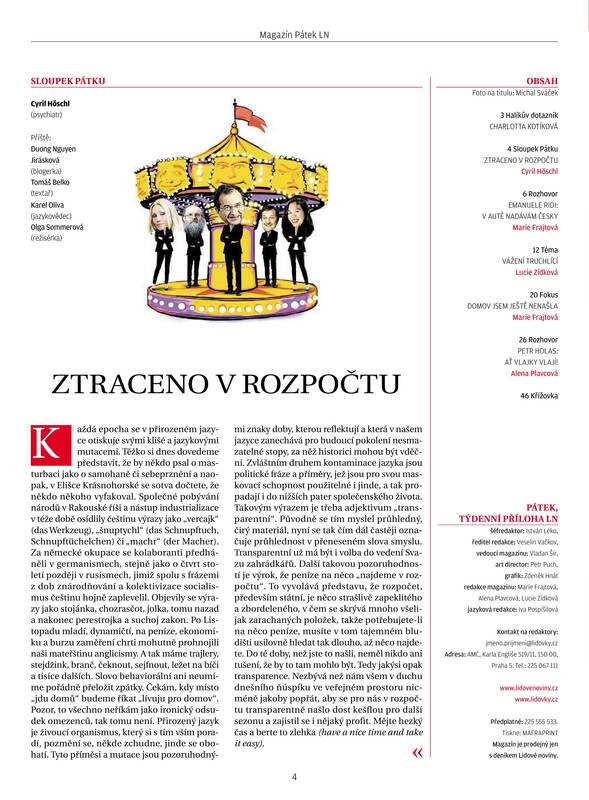 Vol.26, 2016, No.1: pp. 69-70. Reprinted from magazine Friday of Lidove noviny [Public News], 11 March 2016, p. 4. Höschl C. Psychiatric diagnosis. Reflex 23/2016, p.68. Höschl C.: Previously, they were considered lazy, now we know they are depressed. Lidové noviny daily, June 15, 2016. Höschl C. Do refugees come to harm? Reflex 24/2016, p.68. Höschl C. Botched cases add to offenders insolence. Reflex 25/2016, p.68. Höschl C. Darkness therapy. Reflex 26-27/2016, p.86. Höschl C. Madness or OCD? Reflex 28/2016, p.68. Höschl C. Sunbathing harms or benefits? Reflex 29/2016, p.66. Höschl C. Have blind people dreams? Reflex 30/2016, p.70. Höschl C. Little mole dependence Reflex 31/2016, p.70. Höschl C. Minderwertigkeitsgefühl. Reflex 32/2016, p .68. Höschl C. Chutzpah. Reflex 33/2016, p. 70. Höschl C.: On pseudologic. Magazine Friday of Lidové noviny. August 19, 2016, p. 4. Cyril Höschl: Esperanto estas la ŝtono filosofal? Reflex 34/2016, p. 70. Cyril Höschl: Men and their old girls. Reflex 35/2016, p. 70. Interview: Take sometimes your hands off of the keyboard... Magazine Psychology Today. 9/2016, pp 8-11. Cyril Höschl: On domestic violence. Reflex 36/2016, p. 66. Höschl C.: Dream of a social engineer. Magazine Pátek [Friday], Lidové noviny [Public News], 16.9.2016, p.4. Höschl C. Blame for illness. Reflex 38/2016, p.68. Höschl C. Herpetic encephalitis. Reflex 39/2016, p.66. Professor Cyril Höschl: Europe has lost providence. Maybe it's too late to recover. Failure of politicians, trouble with the export of democracy...Aréna, Parlamentní listy [Parliamentary pages], 30 Sept 2016. Höschl C: On smoking dependence. Reflex 40/2016, p. 70. Höschl C: Lexmalla, lex nulla. Reflex 41/2016, p. 68. Höschl C: Crazy mother. Reflex 42/2016, p. 78. Höschl C.: Lost in the budget. Magazine Pátek (Friday), Lidové noviny, 27.10.2016, p.4. Höschl C. Advertisement. Reflex 45/2016, p.76. Höschl C. Höschl C. Security of uncertain times. Vita Nostra Reuve, 26,2016;3:63-66. Reprinted from: Sedláček T. & guests: How will we live in 20 years? 65. pole publ., 2016, pp.42-49. Entry into the sequence of Events on the CT24, topic: fear of terrorism. 22/12/2016 at 22:00. Footage 35:02. Höschl C. Average salary. Reflex 52/2016, p. 66. Höschl C. Exhibition Reflex 3/2017, pp. 66. Höschl C. Dignity for psychiatric patients. World improves very slowly and always at the expense of temporary losses. Interview in Revue 50 plus, vol.XIII, No.1-2/2017, pp.6-9. Höschl C. German narcissism. Reflex 10/2017, p. 68. Höschl C. How the society is divided. Reflex 11/2017, p. 68. Höschl C. There are no chaps to marry. Reflex 13/2017, p. 68. Höschl C. Who is to blame?. Reflex 14/2017, p. 68. Höschl C. Shared custody? Reflex 15/2017, p. 66.